With the release of his eighth studio album “Trouble Man: Heavy Is the Head” in stores everywhere and iTunes right now, rapper T.I. was the next artist to visit the world’s most dangerous morning show, The Breakfast Club. In this clip with Angela Yee, Charlamagne Tha God and DJ Envy, the ATL emcee discussed celebrating the two year anniversary of the breakfast club last night with Power 105. They went on to speak about the musical content T.I. released during his problems with the law not being able to release that “T.I.P.” music we all love. With those problems behind him, Angela Yee went on to say he recorded 127 songs for the new album (the most he’s ever done) in comparison to the usual 50 songs he’ll record. T.I. spent more time on this album to put together the best package of music in over 5 years. T.I. speaks on his positive aura which he’s focusing on being more humble this time around to do more for the urban communities and be a better role model for kids. T.I. discusses on becoming a bigger person straying away from beefs in music and the streets which he’s focused on elevating his career. 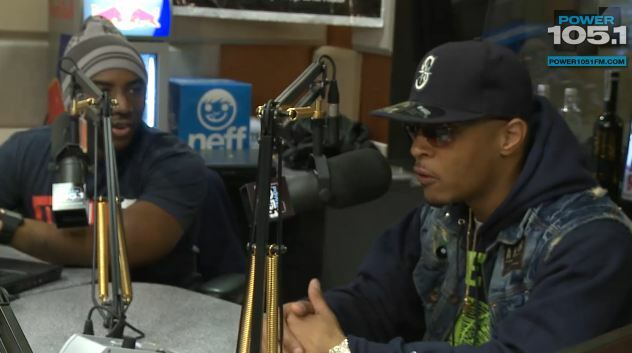 Charlamagne jokes we’re witnessing a real lifeT.I. vs. T.I.P. which he’s really right as T.I. is looking to advance his career and life with his family to keep putting out music and stay on the outside.